Passover 2019: What to do and when to do it. Please don’t forget to enjoy the Holiday! Egyptian slavery more than 3,000 years ago. 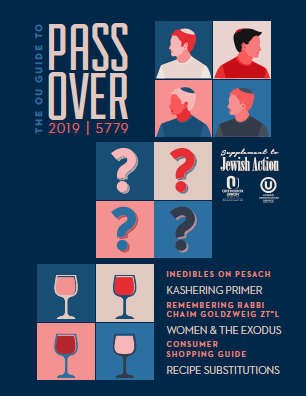 This guide will help not only explain many of the laws related to Passover—such as when various customs and commandments are done—but will also elaborate on the terms associated with the holiday. If you are unsure about any aspect of Passover observance please consult an Orthodox rabbi. The festival takes place from the 15th to the 22nd of the Hebrew month of Nisan, that is from Friday, April 19 through Motza’ei Shabbat, April 27 on the secular calendar. The restrictions of chametz begin on the morning of Friday, April 19. See Halachic Times. A search for chametz is conducted Thursday evening, April 18, and the chametz that is found is burned the next morning. The eve of the holiday—this year Friday, April 19—is a fast day for Jewish firstborn males, commemorating the miracle which spared the firstborn Jewish sons from the Egyptians’ fate of God’s tenth plague—the last to precede the Exodus. In many congregations, a siyum is conducted, in which a portion of Torah is concluded—a celebratory occasion which allows participating males to break their fast. Before Passover, there is a custom to give Maot Chitim, money for the poor to buy matzot and other food for Passover. All dietary laws and restrictions remain in effect until nightfall of the eighth day of Passover. Chametz which was properly sold may only be eaten once the resale is confirmed by your agent. Chametz which was in the possession of a Jew during Passover, in violation of Jewish law, is forbidden for consumption by any Jew even after Passover. The intermediate days of Passover (chol hamoed: Monday, April 22 – Thursday, April 25) are considered “semi-festive.” Only certain work, activities and crafts, as defined by Jewish law, are prohibited. Ask an Orthodox rabbi for guidance. The home must be thoroughly cleaned of all chametz. Any chametz that is not removed from a Jew’s premises before Passover should be sold and the storage locations leased to a non-Jew. Your Orthodox rabbi can help. View guidelines on what can and should be sold. All cooking and eating utensils must be either set aside exclusively for Passover, or in some cases kashered (in consultation with a rabbi), according to the procedures of Jewish law. See our Kashering Primer. For specific questions, consult a local Orthodox rabbi. Even foods with minute amounts of chametz ingredients, or foods processed on utensils which are used for chametz, are not permissible for Passover use. Practically speaking, any processed food that is not certified “Kosher for Passover” may potentially include chametz ingredients. There are two Torah obligations and five rabbinical obligations performed during the Seder. Also: a bowl of salt water should be placed near the Seder plate. This year, as the first Seder is on a Friday night, it is preferable to prepare the salt water mixture prior to Shabbat. Immediately thereafter, a second, smaller volume of maror is eaten with matzah in Korech (the Hillel sandwich). 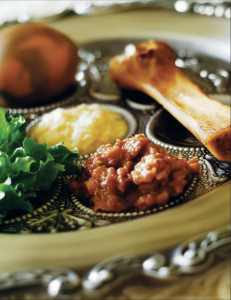 Young children are encouraged to participate in the Seder to the extent of their ability. It is customary for the youngest person at the Seder to ask the Four Questions. The formal part of the Seder closes with Hallel, which praises God and His special relationship with the people of Israel. The Seder traditionally concludes with the singing of several lively songs celebrating the relationship between God and the Jewish people. which must be baked before the dough has had time to rise — within 18 minutes or less. It is the only product based on the five grains (wheat, barley, oat, spelt & rye) which Jews may eat during Passover, and it must be made specifically for Passover use, under rabbinical supervision. Not eating gebrokts (Yiddish, meaning matzah that has become “wet”) is a custom by which some Ashkenazim will avoid putting matzah (or any derivative, such as matzah meal) into any liquid to prevent the possibility that improperly mixed dough, that might have any stray flour that was never exposed to water (and is therefore still susceptible to leavening), would subsequently become chametz when finally exposed to liquid. The Seder is a symbolic reenactment of the Exodus, with a compelling message for young and old alike. The Seder details the journey of the exodus from Egypt by Jewish slaves following a traditional order of blessings, eating symbolic foods, narratives, commentaries and song.